At around 4 a.m. Saturday, Lt. Col. Emanuel Moreno, a senior commander in the General Staff Reconnaissance Unit (Sayeret Matkal), was killed in a fierce battle with Hizbullah fighters near Baalbek in the Bekaa valley not far from the Lebanese-Syrian border. From the details of the commando raid that have filtered into the media, we learned that Moreno and his men were airdropped into the area by helicopter along with their two Hummer vehicles, with the mission of attacking a Hizbullah base in the nearby village of Bodei used by the Iranian-sponsored guerrilla fighters for weapons smuggling. Iran is now working steadily to replenish Hizbullah's surface to surface and anti-tank missile stocks and augment them with anti-aircraft missiles. Israel's continued sea and air blockade of Lebanon, which Kofi Annan is pushing the Olmert government to lift, forces Iran to resupply Hizbullah by land through Syria and into the Bekaa valley. Moreno and his men were discovered by Hizbullah fighters around the heavily guarded enclave and a pitched battle ensued. Moreno was killed, another officer was seriously wounded and a third was wounded lightly. At least three Hizbullah fighters were killed and two were reportedly taken prisoner. Close air support from helicopters and fighter planes prevented Hizbullah reinforcements from participating in the battle or encircling the IDF commandos who were extracted – with their casualties and prisoners – after a prolonged firefight. Moreno, 35, was a hero. He was admired and respected by his soldiers and officers. Those who knew him well agree that his most outstanding features were his humility and his Zionism. Moreno lived modestly with his wife Maya and three young children in Moshav Tlamim by Sderot. He never wore his uniform in his community – he wasn't interested in people knowing how senior an officer he was. He was in the IDF to serve his country and his people, not for the glory. He was a loyal son of Jerusalem. EXACTLY A year before his death, Moreno's humility and dedication to serving his country brought him to perform a different sort of nocturnal mission. Every night last August – until precisely 52 weeks before his death – he snuck into Gush Katif to bring food to his brother David and his family who were besieged along with the rest of the residents of Gush Katif by a force of some 50,000 IDF and police forces. These forces, who outnumbered the forces sent into Lebanon to fight Hizbullah a year later by 20,000, were under orders not to fight Israel's enemies, but to expel loyal, patriotic Israeli citizens from their homes and communities, destroy their homes and communities and abandon their land to Hamas and Fatah control. David Moreno is a major in reserves in another elite IDF unit. Last year in Neve Dekalim he challenged the IDF to find one soldier who would be capable of throwing him and his family out of their home. Taking David's point and seeking to avoid embarrassment, the senior brass of the IDF beat a steady path to his door, attempting to convince him that he must leave. Sitting in a modestly furnished, book-lined living room, David repeatedly demanded to be told the strategic rationale of the expulsions. Why were these senior commanders following orders to surrender land to terrorists? 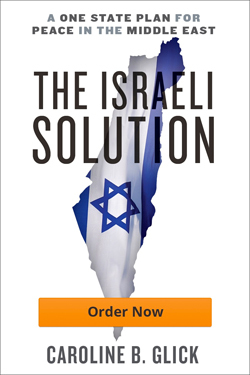 Why were they turning 8,500 Jews into refugees in the Land of Israel in order to carry out a mission conceived by a prime minister desperate to avoid a felony indictment on corruption charges from the radical leftist state prosecution? David kept repeating over and over again that this was not the reason he and his four brothers served as combat officers in the IDF. He warned over and over again that expelling the Israelis from Gaza would strengthen Israel's enemies and lead directly to another war. NONE OF the officers who spoke to David could provide him with answers. The most they could do was lend a sympathetic ear as they suggested he start packing his bags. They could not convince him to leave. In the end, the events had their own momentum. By Friday afternoon, David and his family were more or less the only family left on their street. Everyone else had been expelled Thursday. Over the Sabbath, the remaining Jews of Neve Dekalim darted around in the shadows avoiding arrests by soldiers and police. When they gathered in the synagogue, they were momentarily heartened to see that a couple hundred were still on hand. But their spirits were broken. By the end of the next week, they were all refugees, their homes and communities laid to waste by IDF bulldozers. Their abandoned synagogues awaited destruction at the hands of Palestinian mobs which came three weeks later. Some of the most charged moments at David's home last summer came when he expressed his indignation over the way that IDF Chief of General Staff Lt. Gen. Dan Halutz and his generals daily insulted the religious Zionist community. Halutz threatened to bar the youths who protested the expulsions from serving in the military. Maj. Gen. Dan Harel, who was then OC Southern Command commanded the expulsions, talked about "a lost generation," and demanded an accounting by the heads of the religious Zionist public for their children who refused to accept the legitimacy of the expulsions. Maj. Gen. Benny Ganz, who then served as OC Northern Command, claimed that the youth who protested the expulsions were a greater danger to Israel than Hizbullah. And yet, over the past year, after in many cases having to submit to humiliating interrogations by the Shin Bet, and repeated rejections by draft boards due to their "ideological fervor," thousands of the youths who protested last summer's expulsions were drafted into the army. Like Emmanuel and David Moreno and their three older brothers, these soldiers make up the backbone of the IDF's regular combat and Special Forces units. Like Emmanuel Moreno, a disproportionate number of religious Zionist soldiers have died in the past month of war. LAST WEEK, Vice Premier Shimon Peres tried to silence the growing calls for the government and the members of the General Staff to resign by saying that this is no time for a war between the Jews. His statement is an insult to the intelligence. Demanding accountability from incompetent political and military leaders who led us into defeat against an enemy we could and should have beaten is not opening a civil war. It is the proper response from a responsible public that understands our leaders are incapable of defending the country. Indeed, if Peres is concerned about the possibility of a war between the Jews, then he should be the first one calling for the government to resign. The Olmert government was elected with a platform explicitly committed to carrying out a war against the Jews through the conduct of mass expulsions of up to 100,000 Israelis from their homes and communities in Judea and Samaria. In the midst of this month's Lebanon war, as it became increasingly clear that he lacked the will to prosecute the war to victory, Prime Minister Ehud Olmert attempted to buck up his support in Europe and among the radical Israeli Left (of which his children and wife are proud members), by saying that the war in Lebanon would pave the way for the mass expulsion of Israelis from Judea and Samaria. Saturday, Foreign Minister Tzipi Livni appointed a senior diplomat Yaacov Dayan as her point man for future negotiations with Syria. Her decision to appoint an envoy for talks on surrendering the Golan Heights to Syrian dictator and Iranian toady Bashar Assad came just days after Assad announced that he hates Israel, wants nothing to do with peace and is committed to Israel's destruction. ent who also are pushing peace talks with Assad, Livni may be stupid. Second, Livni may have appointed Dayan in the hopes of stirring up internal fissures over the issue of land for peace. Already the radical leftists who run Israel's media are engaging in surrealistic debates about the possibility of making peace with Assad the warmonger. These debates immediately place religious Zionists on the hot seat for their stubborn insistence on settling the land which makes giving it to Israel's sworn enemies all the more difficult for people like Livni and her friends. Last summer in Gush Katif, there was no war between the Jews. Last summer, under orders from Ariel Sharon and Olmert, the IDF and the police fought a war against the Jews. David and Emmanuel Moreno didn't fight against Israel. They didn't fight against the IDF. The Morenos fought against insane policies that victimized 8,500 patriots for no reason other than Leftist anti-religious prejudice, and that caused Gaza to become a new base for global jihad. And then, when war came from our emboldened enemies, as they warned it would, the Morenos loyally served beside their brothers and countrymen in defense of Israel. When the outraged Israeli public sends this incompetent government and General Staff home, it will not be starting a war between the Jews. It will be preventing another war against the Jews.